CUSTOM VINYL BANNER AND SIGN SALE STILL ON, BY POPULAR DEMAND! Vinyl banners are everywhere. From “Sale” to “For Rent” to your company logo, custom vinyl banners and signs are an economical way to grab attention. The vinyl banner material makes them durable in any weather, and our ability to print in vivid, full color will make them pop. Last month we featured our vinyl banners, with promotional pricing that evidently blew your socks off, because the orders are still coming in. So we’ve extended the sale through the month of May. Got a trade show coming up and need a custom banner for your trade show display? Are you a construction vendor that needs an outdoor vinyl banner for site identification? Or maybe you’re in an up-and-coming garage band with your first scheduled gig and need an awesome custom vinyl sign that rocks! Any of these, and many many more, are good applications for one of our custom vinyl banners and signs. This pricing is based on your print-ready file, but we have a graphic designer available on site if you need assistance with your artwork. Design time and tax is extra; minimum turnaround time is 2-3 working days. This offer not good in conjunction with any other. 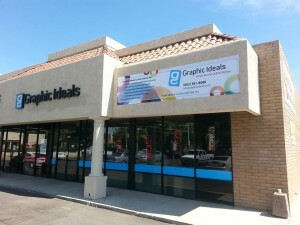 Vinyl banners are versatile, economical and, at Graphic Ideals in Phoenix, printed with great care in vivid color. What situation do you have that a custom vinyl banner or sign could help? Come in, call or click here for further assistance with your vinyl banner printing. your banners are really fantastic and comes with fair pricing. loved it.